I mentioned in a previous post that I got an awesome bread book for my birthday. See! Even little mice (EJ) can't get enough of this delicious bread! OK now for some recipe hints,tips, tricks, and what not to do. The first batch I made (pictured) was made with store bought "White Wheat Flour" (King Arthur I believe.) I bought it at my local Winn Dixie (golden springs.) 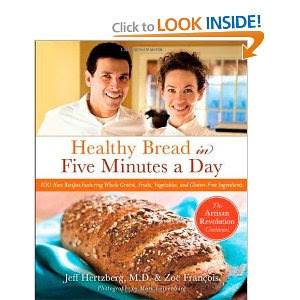 It was on sale for $3.49 and should make 4-6 batches of dough (8-12 loaves.) It looked just like the flour I had ground myslef (more on that.) It is light in color and had a good fine consistency. When I mixed up the dough it was a pretty wet dough. After the initial rise it pretty much filled up my 5 qt bucket. On baking day I used half of the dough for 1 loaf. The dough was sticky but had good elasticity and I was very easily able to form a loaf. I noticed that the color of the dough was yellowish. After baking the loaf rose quite a bit over the pan. One of the pans that I filled a bit to high dripped one blob of dough on my oven but not much. 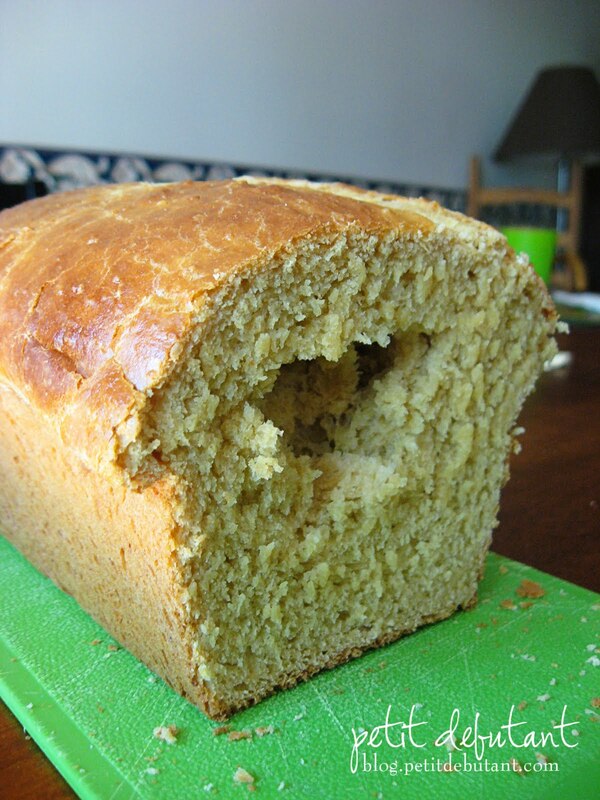 As you can see the baked bread has a yellowish coloring and it looks almost cake like. It was very moist and not too crumbly. Delicious! The second batch of bread I made was made with the my food storage wheat. I thought it was the same as the store bought white wheat but I was wrong! It looked the same and had the same consistency but when the dough was mixed up it did not look yellow at all but tan. It was a bit drier as a dough as well. It rose perfectly as the first batch and when I went to shape the dough I realized it was drier and not as elastic. I had a slightly harder time shaping the loaf to be smooth because of the lack of elasticity. I think this could be fixed by 1) adding more water 2) adding less wheat flour and more white flour 3) I'm going to be trying to mix in some of the store bought white wheat flour and a bit more water as well. 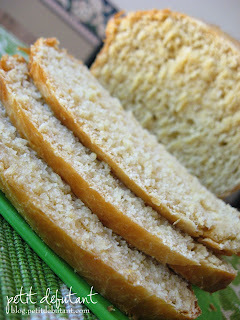 Once baked the bread had a darker tan coloring to it and was a bit more crumbly after slicing. I noticed it also got stale quicker, probably because it was drier to begin with. It was good but you have to be used to the wheat taste in order to appreciate it. A few days ago I confirmed that I did indeed have Hard Red Wheat in my food storage. It is a stronger flavor than White Wheat and is not so great for bread. White wheat is the best for making bread, but since I have quite a bit or red wheat I'll be trying to use it up so I can replace it with white wheat. Here is how to use up that red wheat: Make lots of bread and share it with your friends. Me first of course! that looks so good.... wish I had time to make bread from scratch. But I would rather sew. Maybe you will bring some to quilt guild??? This is great! I have a bread maker that I would like to use more often and have been wanting to try a homemade bread using Kamut Wheat since it is so great. I just really want to make sure our kids (and hubs and I) are getting all kinds of nutrition and it has a great flavor and texture too! Yours turned out beautiful for sure - oh I am so inspired now!